What makes your favorite pot so special? Is it the shape of the form, the feel in your hand, or the vibrant color that creates excitement within you? Pots have the power to evoke memories, feelings, and emotions. Let’s create those pots! In this class participants will learn to create a variety of handbuilt functional pots using paper patterns (made during the workshop) and soft clay slabs. We will explore a variety of forms and attachments including lids, feet, and spouts. Pots will be made from earthenware clay, and there will be discussion and work time allotted towards surface treatment using terra sigillata and underglazes. This workshop emphasizes one-on-one interaction in a supportive, positive environment where experimentation is encouraged and individual development nurtured. Throughout the weekend, the group will discuss how to draw from personal influences in order to better individualize their work. Participants will explore the broad term "function" through slide talks, class discussion, and the making of pots. Participants are encouraged to come with specific questions, sketches and images (not only of pots) that they are drawn to. Basic handbuilding skills are suggested, but the class is open to all levels. Bisque firing only. Recontextualizing utilitarian objects is a common thread woven throughout work. My interest lies in what an object once was and what it can become; this curiosity fuels me to create my work. I reference functional, everyday objects and intend to formalize them by focusing on their form, surface, and presence in space. The beauty of utilitarian objects is that they are capable of functioning away from their primary context, but also retain their inherent sense of utility. In this new location, the object acquires an “aesthetic” use rather than a “functional” use. In either context, a box, for instance, possesses a specific purpose whether it is to contain or sit among others of its kind. I am passionate about collecting and the theories involved. Why do we collect and display certain objects? What new meanings arise once they are grouped amongst similar objects? Within a collection, everyday objects have the ability to gain importance as members of a whole. They start to become more than the sum of their parts; subtle nuances are noticed, and have the potential to give value to valueless objects. My recent body of work continues to reference functional objects and address theories of collection. Currently, the most important influence in my life is my daughter, Roby. I find that the objects that surround me, and in turn influence my work, belong to her. They are playful items: toys, games, and most of all balls. They are stacked, grouped, and contained throughout our home. I have acquired a new collection and inspiration, and thus a new body of work has emerged. Liz attended the University of Minnesota in Minneapolis to complete her Masters of Fine Arts in 2001. She currently works as a full time studio artist from her home in Bakersville, North Carolina. 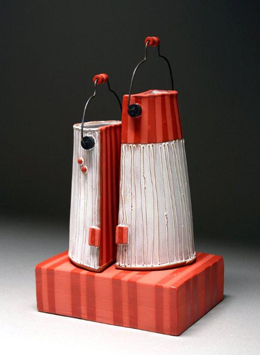 She has been an instructor and visiting artist at numerous clay facilities, colleges, and universities. She exhibits and sells her work nationally through exhibitions, galleries, and fine craft shows. She has been featured in and on the cover of Ceramics Monthly and Clay Times magazines.